The most anticipated student activities event of the year was a smashing success! The school turned shades of yellow, blue, red, and green for Color War 2017: A Mikdash in the Making. Many of the two-day program’s activities were Mikdash-themed–such as the Chidon, divrei Torah, and See-Run-Build–while other events reflected more standard Color War fare, like a spelling bee and athletics competitions. 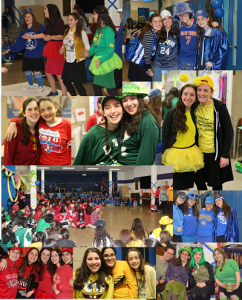 We salute the grade-wide generals and captains, under whose direction our students competed with spirit and respect: Freshman General Rebecca Boim and Captains Jessica Friedman and Gabriella Rahmanfar, Sophomore General Tehila Rothbort and Captains Ilana Rouhani and Felicia Weintraub, Junior General Ellie Berger and Captains Daniella Finkel and Kayla Manouel, and Senior General Batya Kupershmid and Captains Risa Friedman and Deena Motechin. Thank you to the entire Color War Committee for a fantastic two days. Congratulations to the SOPHOMORES on their epic win!